You hear this word so often. Maybe it’s celebrity “x” going to a detox or rehab center to detox from drugs or alcohol. While hopefully you are not reading this article because you have to detox from drugs, maybe you’re feeling a little sluggish from a couple rough weekend days of unhealthy eating or drinking too much and want to get back on track(reason why I thought this would be a good blog post). By definition, detox means to remove impurities from the blood and other organs. The organ that is responsible for most of this removal process is the liver. That’s because the liver’s main job is to filter your blood from the digestive tract before it gets sent through to the rest of your body. A highly functioning liver equals clean blood, which is exactly what we are after. This can help you feel so much healthier. Certain foods have been shown to help stimulate and protect the liver, allowing it do its job more effectively and more efficiently. This heightened level of performance allows the liver to remove more impurities from our systems. If you are already eating a diet full of vegetables, fruits, lean proteins and healthy fats, you probably are already including plenty of these foods in your daily diet. If not, there is no better time to start than now, because you’ll feel and look better than ever. The following is a list of the top detoxifying foods that are sorted by beverages, fruits and vegetables. Remember to be sure to consult with your medical professional if you have any health concerns before adding these toxin eliminating foods into your diet. Many can interact with medications. 1. Water – Over 51% of the adult human body is composed of water. By drinking plenty of water, you are able to maintain adequate levels in your body, which is especially helpful to your kidneys. The kidneys eliminate toxins and waste through urine, which will have been passed on to them by the liver for removal. If the body is not properly hydrated, the body may hold onto these toxins instead of eliminating them. This is why you should always aim for eight 8-ounce glasses or half your bodyweight in ounces daily. 2. Nettle Tea – The stinging nettle flower gets its name from the ability to leave fine hairs upon the skin of individuals who come in contact with it, causing a burning or stinging sensation in the skin While it can be consumed in various ways, the leaves are often dried and available in herbal teas. Nettle works by reducing inflammation in the body, which has led to its popular use for treating allergies and arthritis. If you are pregnant or on medication, be sure to consult to consult with your physician before consuming nettle tea. 3. Dandelion Root Tea – Considered a weed by most people, the dandelion is actually a nutritional powerhouse. The entire plant is edible, but for the purpose of liver health, we will focus on dandelion root tea. Tea is the most common way to consume dandelion root. It is believed to be a natural diuretic that also contains potassium. This diuretic effect can help the improve the removal of toxins from the body. Again, be sure to consult with a medical professional before consuming dandelion root tea as it can interact with medication. 1. Lemon – The lemon is a yellow, acidic citrus fruit grown from trees in warm climates. The lemon is known to help clean the blood by producing and controlling the flow of bile from the liver into the digestive tract. Lemon is most commonly consumed by squeezing the juice into a glass of water. Five days a week, I start my day with a glass of room temperature water with lemon – it’s delicious! 2. Grapefruit – This is another citrus fruit with a tart and tangy flavor and a high dose of vitamin c. Grapefruits are high in antioxidants and flavonoids. These nutrients can help the liver break down and remove toxins from the blood in greater amounts. If you are taking prescription drugs, be sure to talk to your doctor about any interactions with grapefruit. 3. Watermelon – My favorite fruit on this list!, the watermelon is commonly thought of simply as a fruit compromised of mostly water without much health benefits or nutritional value. But this is so not true! Watermelon is full of nutrients we can’t get from many other foods. For example there is an amino acid, citrulline, found in watermelons that is converted by the body into arginine, which helps improve blood flow throughout the body and has a cleansing effect with its mild diuretic properties. 1. Artichokes – The artichoke is considered to contain as many antioxidants as blueberries, cranberries, and dark chocolate. Cynarin and silymarin, two phytonutrients found in artichokes, help the liver produce bile, which in turn breaks down foods and toxins in the digestive tract. 2. Asparagus – The asparagus plant might make your pee smell a bit funny if it’s in your genes, but it is also one of the most nutrient-dense vegetables you can choose. It is extremely high in glutathione, an amino acid that provides lots of health benefits, including being vital to a healthy liver. 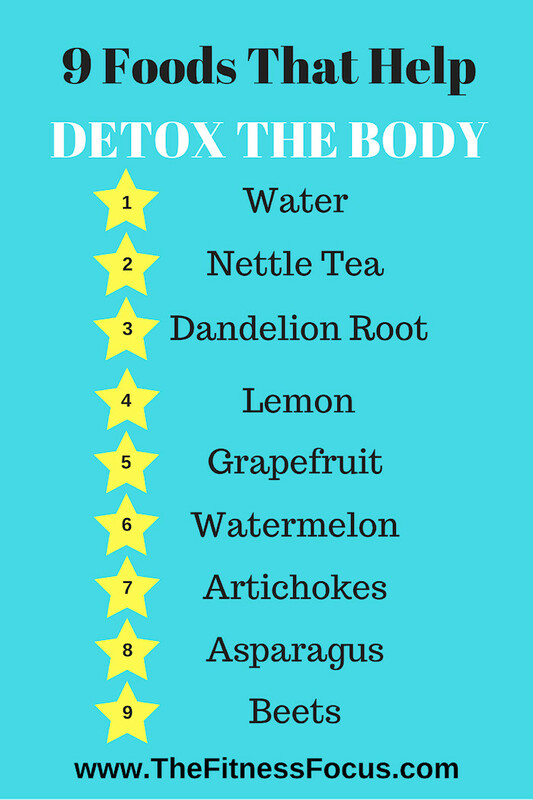 For detoxing the body, it helps break down toxins and allows the liver to detox fat from bile before it is passed along further into the digestive system. 3. Beets – This deep red, sugary vegetable is one of the only vegetable that is a source of a betanin. This phytonutrient has shown to help detoxify the blood by improving the function of the liver. Beets provide the most health benefits when eaten raw or when lightly roasted, which means you must try to avoid canned beets whenever possible. Remember, a day of eating foods that help detox the body is not a replacement for a healthy lifestyle. You cannot quickly undo a lifetime of unhealthy habits with a day’s worth of detox. It will take time to feel and see the difference.